If you could do something just 15 minutes a day that could give you a longer life, would you do it? For most people that would be a no-brainer. 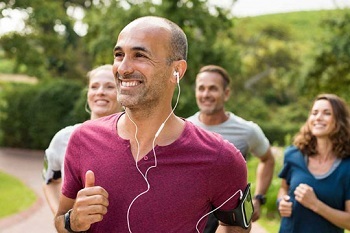 “One study showed that 15 minutes of walking daily can extend life,” says Gary J. Rogal, M.D., medical director for Cardiac Services at RWJBarnabas Health. But alas, too many people don’t walk that walk. As a cardiologist, Dr. Rogal has a professional interest in the treatment of heart disease. Indeed, he is more than ready to offer treatment when appropriate. But the message he most wants to convey is about a low-tech “treatment” you can administer yourself. It’s called exercise. “Sometimes adherence to medication regimens and recommended lifestyle changes—such as increased physical activity—can be more powerful than procedures such as stenting and angioplasty,” says the doctor, adding that extreme caution must be used in pursuing procedures in any case. That’s why those 15 minutes of daily walking are so important. Research has shown that people can go a long way to prevent a cardiac event—or to improve their prognosis after an event—with regular physical activity. And it doesn’t have to be vigorous. Studies also show that, besides getting exercise, you can improve heart risk by taking other specific steps, such as making changes to diet and using prescribed medicines when necessary to lower blood pressure. In fact, new guidelines, announced late last year, focus on empowering patients to take these steps seriously. One thing these guidelines do is make blood-pressure targets more exacting, with the result that instead of just 30 percent of Americans having hypertension (high blood pressure), now 50 percent do. The idea is not to label people, but to stir them to be proactive about their heart health. Dr. Rogal describes the roles of the patient and his or her physician as a 50–50 proposition: treatments that medical professionals offer account for half of the health benefits to a patient, and the steps patients take—such as getting exercise, sticking with a healthy diet and managing blood pressure—account for the other half. That’s an important message for patients. Since half of your cardiovascular risk is something you can improve, you have significant control over your own health. In the COURAGE study, published in 2007, patients with stable heart disease were divided into two groups. Those treated with medications and lifestyle changes alone fared just as well as those who had been given stents. The point? It matters what patients do—your actions can make a difference. Systolic pressure is the top number. It measures blood pressure when your heart contracts. Diastolic pressure is the bottom number. It measures blood pressure when the heart is relaxed. Until recently the target used by most doctors was 140/90 mm Hg (millimeters of mercury). The target now for most people is 130/80 mm Hg or lower. If you have either a top or a bottom number that is higher than this target, you may have hypertension—high blood pressure—according to the latest guidelines from the American Heart Association. “Learn how to measure your blood pressure accurately, and talk to your doctor about all the ways you can improve it,” says Gary Rogal, M.D., medical director for Cardiac Services at RWJBarnabas Health. To take charge of heart health, blood pressure (BP) is an important number to know. But, as with checking your temperature, if the measurement is off, the numbers won’t be helpful. Avoid smoking (which you shouldn’t be doing anyway), caffeine and exercise 30 minutes before the measurement. Sit quietly for five minutes. Wear clothes that you can easily remove to expose the upper arm. Keep still while it’s measured. Get the measurement from both arms, and at two to three different times. If there’s a difference, use the higher numbers. If you’re taking your own BP at home, ask your doctor or nurse to explain how to do so—and how often. Use the same BP cuff each time, and make sure it’s accurate. Make sure the bottom edge of the wrap that goes around the arm is directly above the bend of your elbow. In the morning, take two readings before you take any medicines. Space them one minute apart. In the evening before supper, do the same. If you have a change in treatment for any condition, take your BP reading two weeks after the change and one week before your next doctor’s visit. Record all readings, and take them with you to the doctor. Question: What’s the most underutilized treatment to control cholesterol? The answer is exercise. Exercise improves circulation, controls weight and lowers “bad” blood cholesterol. It’s one of the most important steps you can take to improve heart health. One study showed that the effects of exercise last even long after the activity is stopped. And although it may be because exercisers are motivated to improve in all ways, other risk factors are improved with exercise too—like lipid patterns, blood pressure and diabetes, for example. There may even be a beneficial effect on depression, which in turn makes lifestyle alterations easier. When it comes to making exercise part of your lifestyle, there are two points to remember. First, you don’t have to run a marathon. Even very moderate exercise is helpful. Second, weight and cholesterol control aren’t the only reasons to exercise. Exercise can improve overall health, mood and outlook on life. You may even find your gentle workouts habit-forming—in a good way.